If you’re after a fast paced, in your face kind of travel experience, spend your honeymoon in Bangkok Thailand. Once you dig a little deeper and away from the tourist trail, you’ll have the most incredible Bangkok honeymoon! 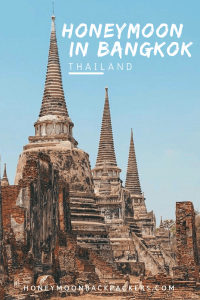 There are so many things to do in Bangkok Thailand, with temples galore, city bike tours, palaces, markets and incredible nightlife. You’ll be surprised how much you love your honeymoon in Bangkok after spending a few days exploring the city. Be wary of the potential scams on your Bangkok honeymoon. 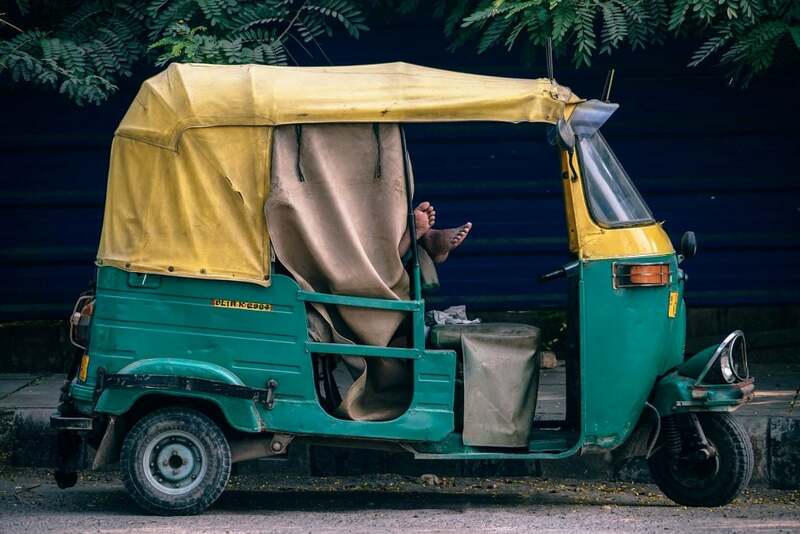 Some cities in Thailand have a Tuk-Tuk scam lures unsuspecting foreigners into paying a fortune for a “city tour”. You’re much better off organising a legitimate tour on your honeymoon in Bangkok, to avoid getting ripped off. Explore this bustling city or discover some of the best beaches in Thailand near Bangkok like the Hua Hin Beaches. Make sure you have a chance to visit northern Thailand too, Chiang Mai, Chiang Rai and Pai are all incredible. No matter how you spend your Bangkok honeymoon, it’s going to be unforgettable! There are many things to do in Bangkok Thailand on your honeymoon. 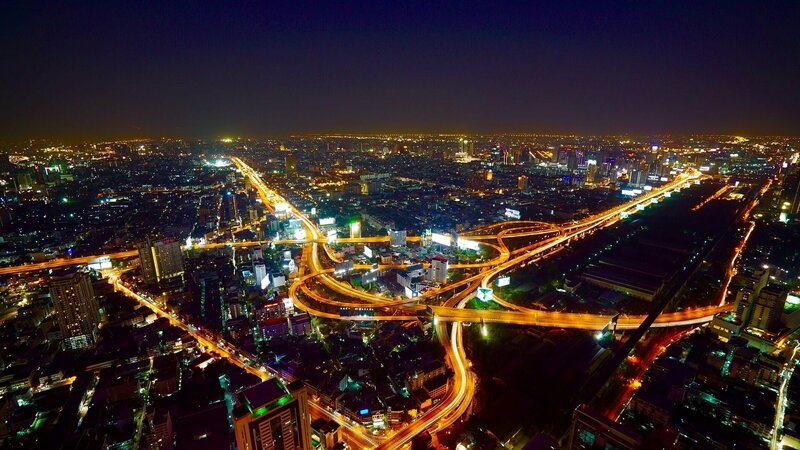 We have a few of our favourites things to do listed below to include in your guide to Bangkok. If you’re on your Bangkok honeymoon and want to travel to see more of the country, take a multi-day extended tour! Perhaps you’d rather a hassle-free Bangkok honeymoon package, there are tons of Viator Bangkok tours to suit all Thailand honeymoon budgets. There are so many places to go on your Bangkok honeymoon just sure you have enough time in this awesome city! 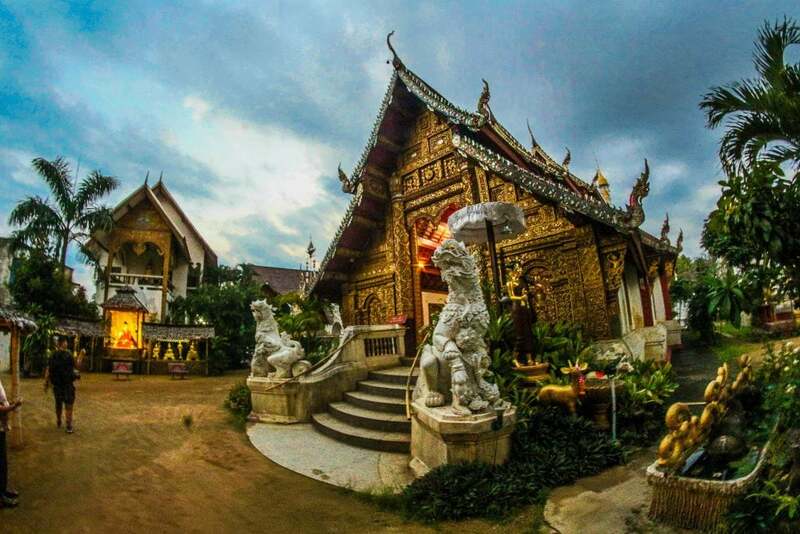 Experience rural Thai culture on your Bangkok honeymoon. 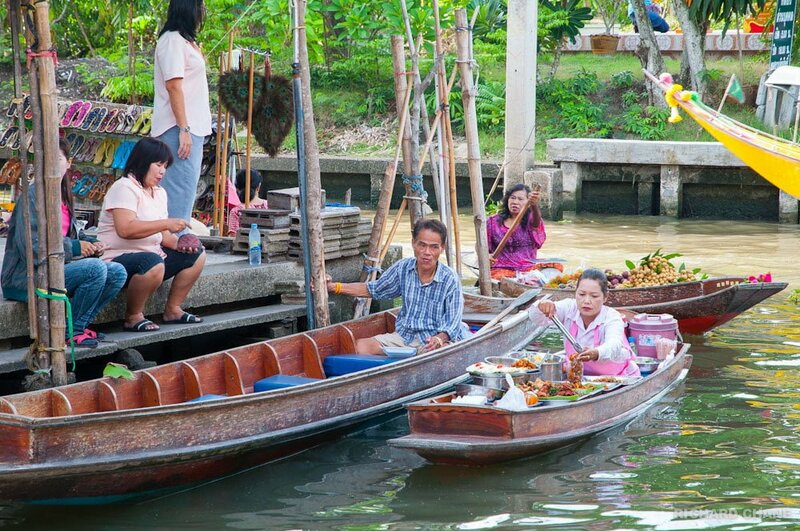 Explore the ancient canal waterways outside the capital of Bangkok through the Saduk Floating Markets. It was constructed in the 19th century by Thailand’s King Rama IV and is one of the best things to do on honeymoon in Bangkok Thailand. Visit the beginning of the ‘Death Railway‘ in Kanchanaburi’s bridge on the River Kwai. Take a step back in time with this poignant reminder of the lives lost during the Second World War. It’s one of the best cultural things to do on honeymoon in Bangkok Thailand. Within the incredible Grand Palace complex are several impressive buildings. Discover the famous Temple of the Emerald Buddha, Wat Phra Kaew which dates back to the 14th century. It’s one of the best things to do in Bangkok Thailand as the Grand Palace is the pride and joy of the nation. Make sure you’ve dressed appropriately if you’re visiting the temples with your shoulders and knees fully covered. You have to see the impressive temples and Grand Palace on your Bangkok honeymoon! Located just next to the Grand Palace is Wat Pho, ‘The Temple of the Reclining Buddha’. An incredible 15 x 43 meter Buddha covered with gold leaf and encrusted with exquisite decorations. It’s such an incredible sight to see on your honeymoon in Bangkok. On the opposite side of the river is the iconic Wat Arun temple, also known as the ‘Temple of Dawn’. At night it’s lit up and offers a spectacular view from the river. Have a romantic dinner cruise along the river on your honeymoon in Bangkok. Experience the thrill of the world’s longest, and highest canopy zip line! Swing through this epic Flight of the Gibbon treetop adventure in the lush Thailand jungle. Why not do something adventurous on your Bangkok honeymoon! Try a walking or bike tour of the city on your Bangkok honeymoon! Explore Bangkok’s Chinatown with it’s narrow alleyways, markets and backstreets as well as the charming local areas of Thonburi. It’s a must do and one of the best things to do in Bangkok. If you’re after a cultural experience as one of your things to do in Bangkok Thailand, then definitely visit the Maeklong Train Market. It’s one of the most unique markets we’ve encountered, filled with an array of local food and fresh seafood. You and your lover can enjoy some of the most delicious food in Thailand here, on your honeymoon in Bangkok. You haven’t seen the best things to do in Bangkok without visiting Thailand’s famous Khao San Road. 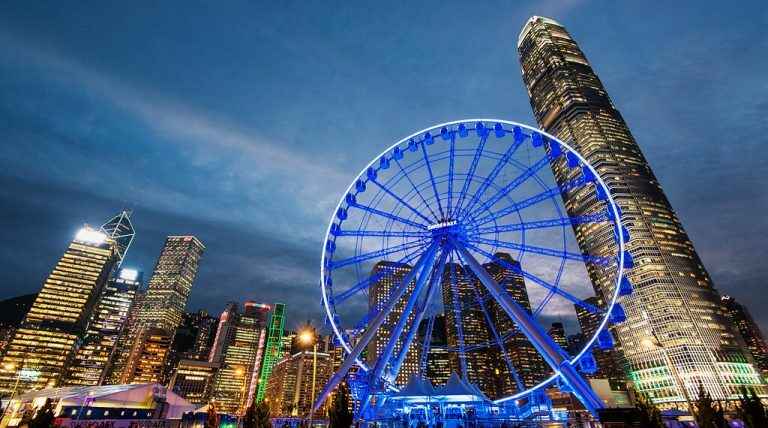 If you’re looking for cheap food, booze and a party atmosphere, you’ll certainly find it here! Party the night away or go shopping to score some cheap knockoff goods on your Bangkok honeymoon. There is something for everyone on Khao San Road, don’t miss this eye-opening experience on your Bangkok honeymoon. Just be wary of the many scams and thieves lurking in the area. You’ve probably heard of Red Sky Bar from the ever so popular film ‘The Hangover 2’. Since then, there have been Sky bars popping up all over Bangkok. If you’re looking for something a little more classy, head to the Grand Centara Hotel for a romantic sunset drink at Sky Bar on your Bangkok honeymoon. There is a dress code so make sure you’re dressed for the occasion. 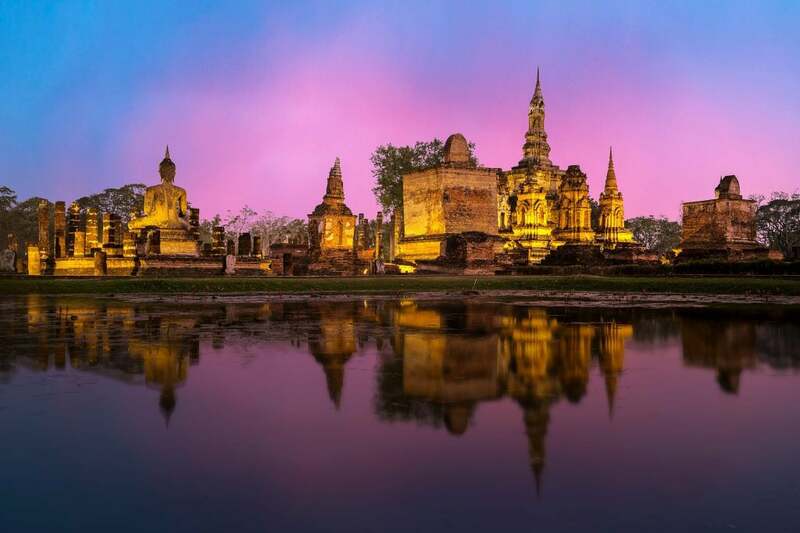 Head out of the bustling city of Bangkok and discover the magical area of Ayutthaya. 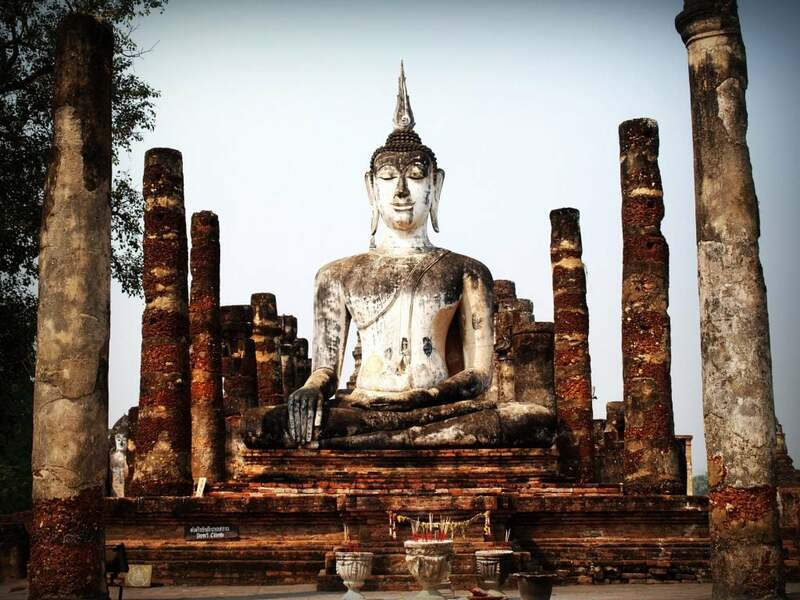 Discover the breathtaking Ayutthaya temples scattered around Thailand’s former capital. It’s such an incredible experience for couples on their honeymoon in Bangkok. 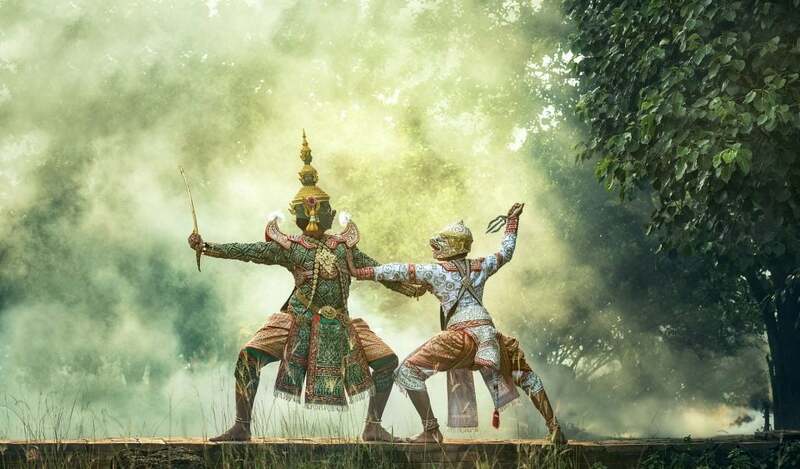 Follow this Ayutthaya travel guide for more info. Eat your way through Bangkok on your Honeymoon in Thailand with a Thai food tour! 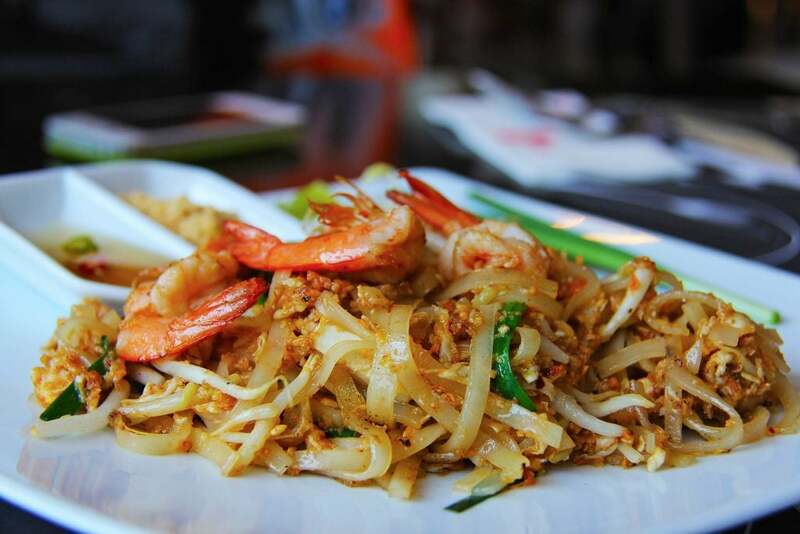 Try 10 different Thai foods and drinks from 7 unique locations sprawled around the city. If you want to try ‘real’ Thai food, on your honeymoon in Bangkok this is your best bet! Take a bit of Thailand home with you with a Thai cooking class for you and your lover. Visit the nearby local market to purchase your fresh ingredients, then learn how to prepare and cook traditional Thai food. When you eat this meal at home, it will forever remind you of your romantic Bangkok honeymoon. 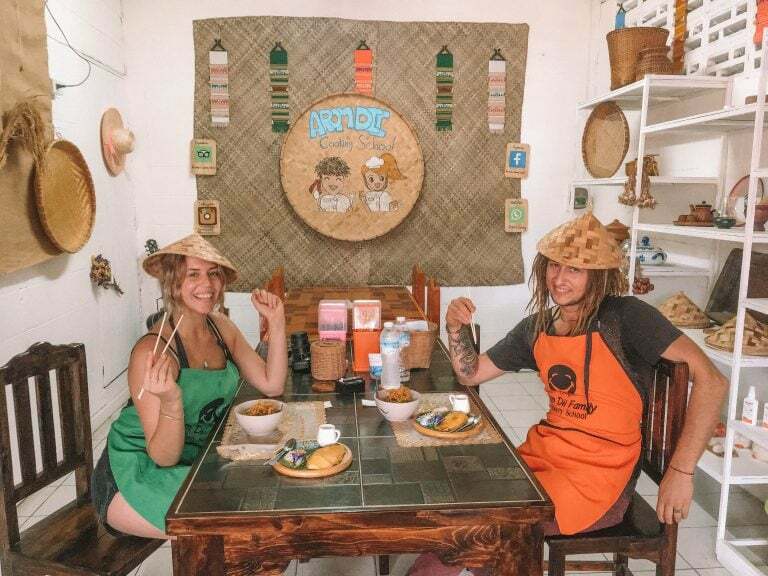 A cooking class is one of the best things to do in Bangkok Thailand for couples! No matter your budget or honeymoon preference, there’s accommodation perfect for your romantic getaways in Bangkok. Airbnb is big here; you can find some awesome retreats and hotels in Bangkok. Here’s $35 free credit for your first stay with Airbnb. If you want to save on the best resorts in Bangkok, here is $20 AUD off your next hotel with booking.com. There are so many awesome honeymoon hotels in Bangkok to cater for every budget! If you’re after accommodation where you can meet other travellers, opt for a cheap private room in a hostel. Perhaps you’d rather an authentic Thai accommodation experience on your honeymoon in Bangkok, try a homestay or guesthouse. There are plenty of affordable but nice honeymoon hotels in Bangkok, with new hotels popping up all the time. If you’re after complete, utter luxury, there are some expensive ultra luxurious five-star honeymoon hotels in Bangkok too! Looking for a cheap, clean private room with a local feel, as your honeymoon hotel in Bangkok? The Sawatdee Guesthouse is a great option for you and your lover with privates starting from just $13 USD a night. The staff are friendly, accommodating and the guest house is located very close to the Grand Palace. A super cheap and convenient option for your Bangkok honeymoon hotel. Looking for the best honeymoon hotels in Bangkok that are away from all the nasty tourist traps? Stay at the Bangkok Saran by the river on your honeymoon in Thailand. The staff are friendly, full of useful information and they give you free water. Rooms start at $42 USD a night and include a free breakfast. It’s located close enough to Khao San to walk, but far enough away to avoid the noise from your Bangkok accommodation. If you’re looking for a more social scene close to the party of Khao San Road, look no further than The Printing House Posthtel. This is one of the most awesome honeymoon hotels in Bangkok as it provides a lively atmosphere in a more upscale environment. The rooms are beautiful and very private, they start at just $60 and include a delicious breakfast. This lovely Bangkok honeymoon hotel offers a spectacular view of the city and is close to all the local sights. The Anajak Bangkok is one of the best honeymoon hotels in Bangkok, conveniently located near public transport. The staff are warm, friendly and helpful, delivering a great level of customer service. Rooms start at $77 a night including breakfast and the beds are super comfortable too. Perfect for couples looking for a romantic Bangkok honeymoon! If you’re after complete luxury with world-class service, stay at the best honeymoon hotel in Bangkok! Splurge on your Thailand honeymoon at The Mandarin Oriental Bangkok. This luxurious hotel is decorated with Thai silk, teak wood and has an incredible outdoor pool. Private rooms start at $600 USD and are worth every penny for the hospitality that you receive. Treat yourself to luxury on your Bangkok honeymoon. Forget a metered Taxi or Uber, prebook your transfer for your honeymoon in Bangkok. It’s far less hassle having your airport transfer pre-organised for your honeymoon in Bangkok, giving you a hassle-free Thailand honeymoon. The Skytrain (BTS) and underground (MRT) rail systems are a great cheap way to get around the city of Bangkok! Use this map to navigate your way around Bangkok on public transport. If you’re going to catch Taxi’s or Tuk Tuks in Bangkok, make sure you get a metered taxi or agree on the price before getting in. Bangkok taxi drivers have a bit of a reputation for ripping off unsuspecting tourists. You can take an Uber in Bangkok, we’re giving you $5 USD off each of your first 4 Uber rides. An even better option than Uber is Grab! It’s cheaper than Uber and there are more drivers. We love using Grab on our Bangkok honeymoon as you can’t get ripped off and don’t have to pay with cash (unless you want to). Here’s up to 100 THB off your first ride with Grab or use our referral code ‘GRABHBACKPACKERS’. Mo Chit Bus Terminal is massive, as it connects the Northern, Central, Eastern and North-Eastern regions of Thailand. Trains are a great form of transport, with the Bangkok Train Station serving as the main terminal to northern, eastern, northeastern and southern Thailand. There are two airports in Bangkok which are 1-2 hours in distance, depending on the traffic. If you have a connecting flight there is a free shuttle transfer between (BKK) Suvarnabhumi Airport and Don Muang Airport (DMK). Majority of nationalities are eligible for a free tourist visa upon arrival. Be sure to check your countries visa requirements prior to arrival at the Thai Embassy’s website. A visa on arrival is free of cost and is valid for 15-30 days. The length of time depends on how you arrive in Thailand and the time of the year you’re visiting. Border crossings generally give you a 15-day visa, whereas international flights give you 30 days for your Bangkok honeymoon. The local currency in Thailand is Thai Bhat, $1 USD = 32 Bhat (dependent on the current exchange rate). There are many international ATMs in Thailand however, they charge pretty insane withdrawal fees. We’d recommend avoiding all small ATM transactions and just the maximum amount of cash out at once. Bring a decent amount of USD (or whatever your local currency is) and exchange it when you get to Thailand to avoid the gnarley ATM fees. 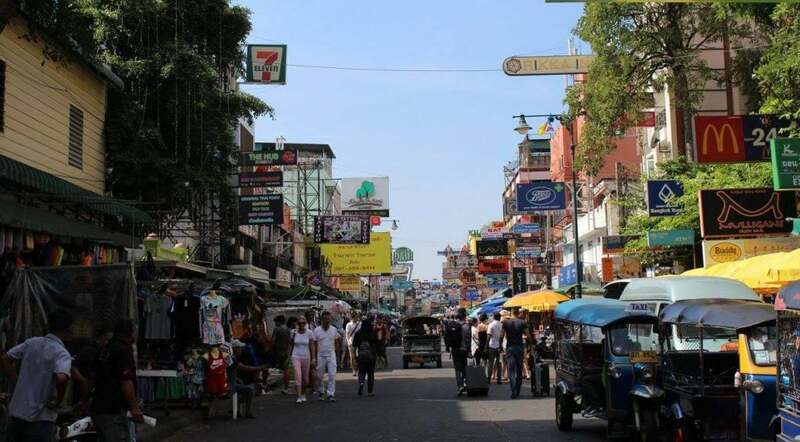 Just be wary of walking around with loads of cash, as you will be a target especially in touristic areas like Khao San Road. If you need to transfer money internationally, use Transferwise, it’s the fastest and cheapest way to move money around when travelling. You’d rather not think about all of the things that might go wrong on your Bangkok honeymoon, but these things can and do happen. We like to think of travel insurance as a safety net, as it’s saved our butts big time on more than one occasion. We had our bags stolen, with passports, cameras and a decent chunk of money, and thanks to travel insurance we were able to replace these valuable items. I fell ill in Cambodia and had to spend a week in a hospital, which racked up a huge bill. Without travel insurance, we would have been in thousands of dollars of debt. It’s not worth the risk to travel without insurance! 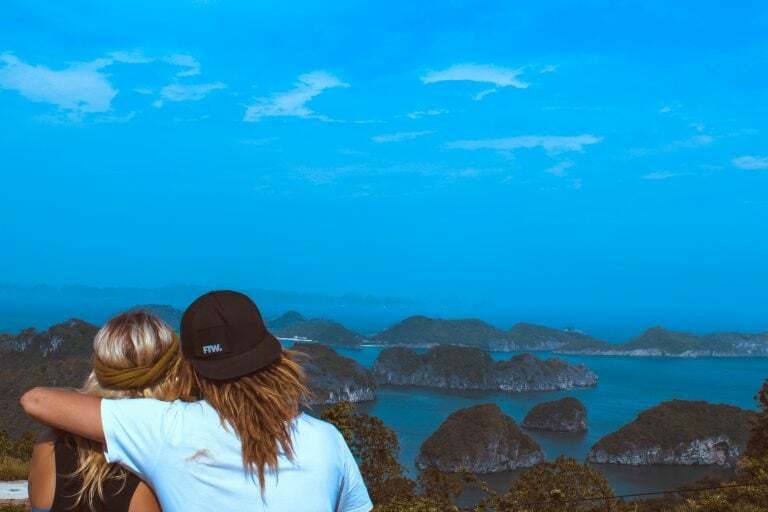 Keep your mind of ease on your honeymoon in Thailand by travelling smarter and safer with World Nomads travel insurance. These guys are the best in the business with affordable coverage for you and your lover on your Bangkok trip. You’re in for an absolute treat and trip of a lifetime on your Bangkok honeymoon! Stay at one of the luxurious honeymoon hotels in Bangkok. Check out the best things to do on honeymoon in Bangkok Thailand, like exploring temples or a Bangkok food tour. Discover the charming night markets, dabble in delicious food and party all night long on your honeymoon in Bangkok. No matter how you choose to spend your Bangkok honeymoon, you’re bound to have an unforgettable romantic vacation in Thailand.